"It’s noon, time to take a nap now ! For all African wildlife animals, that’s the perfect time for relaxing under the shade of a tree, near a watering place. Only monkeys pace like a caged lion..."
Those jungle animals wall decals will allow you to create a peaceful and calming bedroom space. 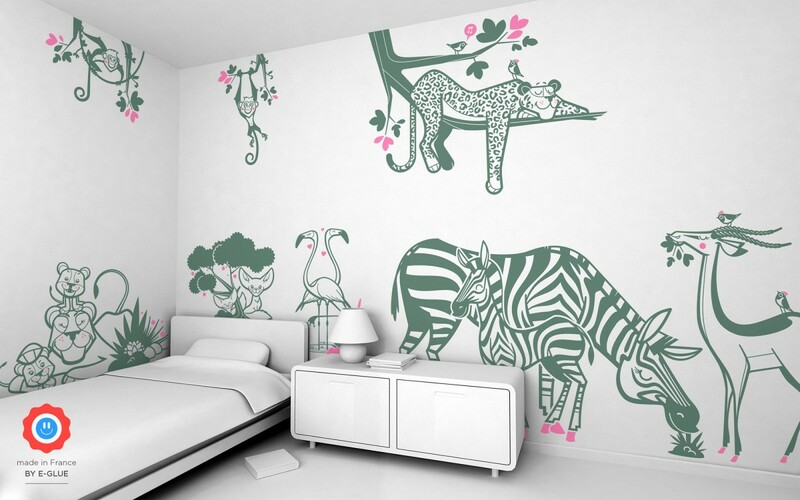 Find all kids favorite savannah animals : zebra, leopard, gazelle, lioness, pink flamingo, monkey, which complete the first E-Glue pack of jungle wall stickers. For example, see below a wall decal Lioness (pastel turquoise and soft pink) applied on a light grey wall.